Need Something a Little More Advanced? There are now so many options as a modern musician in how we can play, practice, perform, transcribe, and compose music. At times, it seems overwhelming with the choices available. It might also be daunting to figure out which cables to use, and what connections you may need. 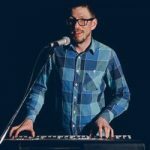 In this article, I will be covering how to connect your keyboard or digital piano to a computer or a smart device, and reasons why it opens many new exciting opportunities as a musician. Digital pianos now include USB, MIDI, and Bluetooth options available to you. That is where I’d like to come in and help you with what would make sense to you and your needs as a modern-day musician. You can basically set up a mini, portable home studio and use your digital pianos as a MIDI-controller following the guide below! I ask you to make yourself comfy, with a beverage of your choice, and read on through to how you can start opening new ways of making music! Connecting your digital piano to an external device is a relatively simple and straightforward process once you have all the necessary equipment. Firstly, you will need a cable that plugs directly into your keyboard. Depending on the model of your keyboard, this is either a MIDI to USB cable converter or USB type A to B cable. Both cables make it possible to connect your keyboard to a computer, Android, or Apple device in order to transfer MIDI data. Note: MIDI is the information that communicates to your computer and translates that information to music. Think of it as the sheet music your computer reads, the computer needs to understand what notes are being played, the dynamics at which they’re being played at, and any expression or articulations. Most modern keyboards feature a USB Type B port, while some older keyboards and pro grade instruments use a MIDI connection (dedicated MIDI In/Out ports). You may notice a USB Type A port in your keyboard, but this cannot be used for transferring MIDI data, you can only insert a flash drive to save recordings onto using your keyboard’s internal sounds. Note: Before buying any of the cables above, first check if your keyboard has Bluetooth MIDI connectivity. If that’s the case, you won’t need any cables to connect to your smart device and transfer MIDI data. Instead, you can do that wirelessly via Bluetooth (provided your smart device also supports it). Connecting to a computer is very simple as you’ll only need one cable in this case. 1) If your keyboard has a USB type B port (aka USB to Host), you’ll need a USB A to B cable such as this one. Plug in the B-end into your keyboard, and the A-end into your computer’s USB port. Note: If you’re a happy owner of a newer Macbook (2016 or later), which doesn’t have regular size USB ports, instead of the USB A to B cable, you’ll need a USB C to B cable. 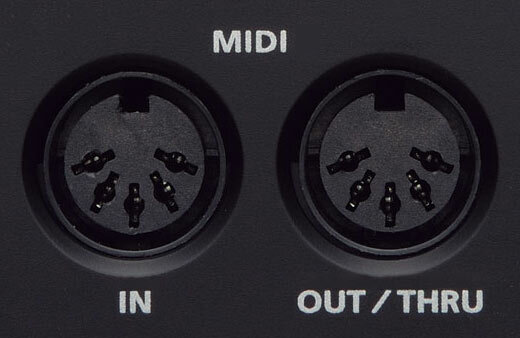 2) If your keyboard doesn’t have a USB Type B port, it will most probably use the traditional 5-pin MIDI In/Out ports. All you’ll need in this case is a MIDI to USB interface. You can purchase one on Amazon or in your local electronics store for less than $50. The iConnectivity mio has proven to be one of the most reliable MIDI to USB interfaces out there. The USB A end will go to your computer’s USB port, while the MIDI In end of the cable will go to the MIDI Out port of your keyboard and MIDI Out end will go to the MIDI In port. You might be wondering why we’re connecting an In end to the Out port and vice versa. Quick fact: Think of MIDI moving like a signal flow – you want the MIDI to flow OUT of your keyboard, INTO your computer, which then goes out of your computer directly into your speakers. The sound is moving in and out, communicating data between your keyboard and computer. There are still many keyboards that only feature MIDI In/Out ports; typically with older models. A lot of modern ones will feature both MIDI and USB type B ports. Note: If your keyboard has MIDI In/Out ports but your computer doesn’t have a regular size USB ports (e.g Macbook, Chromebook, etc. ), then you’ll need to additionally purchase a USB C (male) to USB A (female) adapter to be able to use the MIDI to USB interface. It becomes a little more complicated here, because mobile devices don’t have a full-size USB port, so you will need to purchase an extra adapter to be able to use USB A to B cable or MIDI to USB interface . Alternatively, you can try to find a single cable that’s able to connect directly to your keyboard and into your mobile device, but this will not always be possible since some of these cables simply don’t exist (or very rare). Feel free to comment below if you are not sure which cable to use for your device, and we can help you out! The Lightning to USB Camera adapter is able to connect to your iOS device through a USB A to B cable (or MIDI to USB interface) in order to connect to your keyboard. Connecting this way is a reliable solution, however a more bulky method as you need two cables. Note: If you use an older Apple model (iPhone 4s or lower/ iPad 3 or lower) that doesn’t have a lightning port, you will need the Apple iPad Camera Connection Kit with a 30-pin connector to be able to to connect to your keyboard. If you just need a Lightning connection, you may also use the Lightning to USB type B connector. The pros of using this approach is you only need one cable, less bulk to deal with, and you are saving more money. However, this method is not as reliable as using two cables, plus those single cable solutions can be quite hard to find and they tend to break easily. With android devices, connecting your digital piano will follow the same process as connecting your iOS device. However, the big difference is that you will require a different type of cable as the Lightning Adapter is not compatible with Android devices. 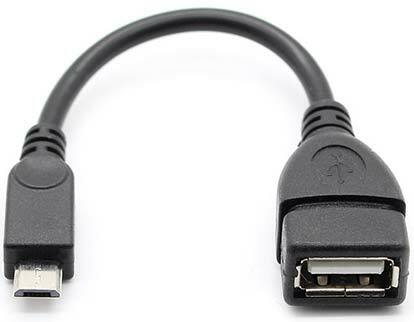 1) OTG (aka “On-The-Go”) USB type A to Micro USB adapter (if your Android device uses a microUSB port). 2) OTG USB type A to C adapter (if your device features a USB type C port). In either case you will still need a USB A to B cable (or MIDI to USB interface in case your keyboard has MIDI In/Out ports), which you’ll plug into the keyboard. The other end (USB-A) will connect to one of the adapters above. 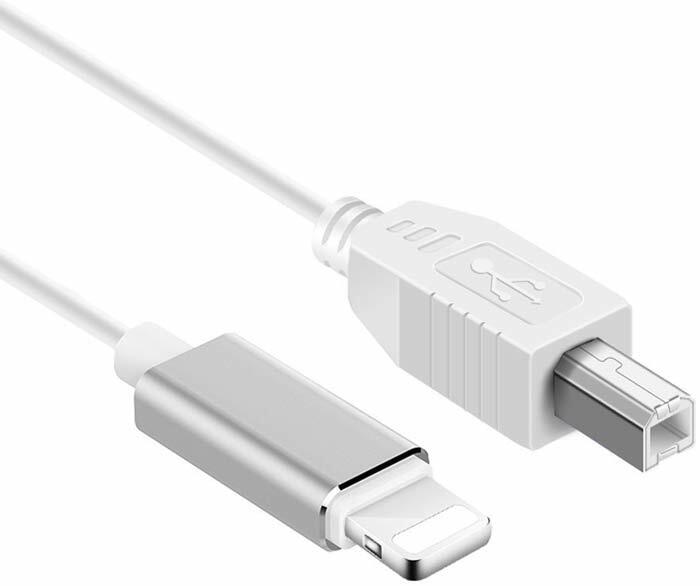 Alternatively, you may want to consider buying a USB type C to B cable, which will allow you to connect to your Android device (if it uses USB type C port) without needing a second cable (USB A to B). However, if you Android device uses a microUSB port rather than a USB type C, you’ll still need two cables. 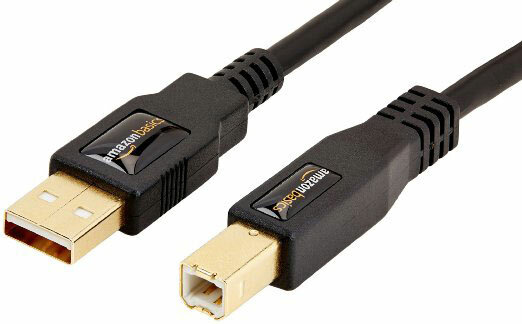 I wasn’t able to find a single cable that would provide a direct connection between microUSB port and USB type B port (or MIDI In/Out). Alternatively, you may wish to use an interface to connect to your computer or smart device. This is a more advanced approach that is more expensive, however, you will have access to extra connections for microphones and guitar pedal inputs. For iOS, you can purchase an iOS MIDI interface such as the Alesis I/O Dock II. Note that this interface can only be used with a keyboard that has MIDI In/Out ports. It offers extra connections for microphones if you wish to record vocals, guitars, orchestral instruments, etc. It also has two 1/4″ input jacks, which means you will be able to record not only MIDI data but also the actual audio signal of your instrument. If you do not plan on using these features, you may simply wish to use a more economical, portable interface like the IK Multimedia iRig MIDI 2. This gives you the option of using Lightning, or USB connections. 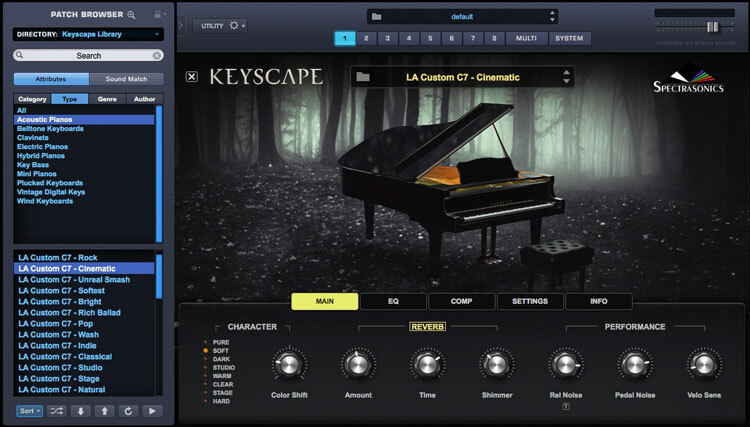 This interface includes a package of free applications including iGrand Piano and iLectric Piano. 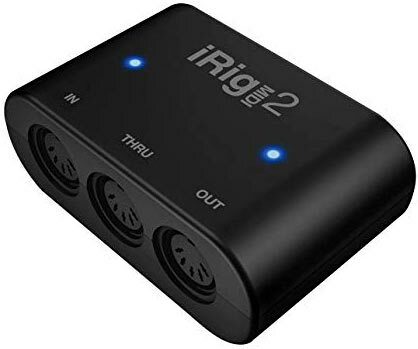 The iRig MIDI 2 only has MIDI In/Out/Through rather than a USB Type A port, so it makes it tricky to connect to your keyboard unless you are using your keyboard’s MIDI In/Out ports. When connecting your digital piano to your PC, you may be required to install drivers in order for your device to work. To quickly explain to you what a driver is, this is basically a software that allows for your digital piano to communicate with the computer’s operating system. The driver allows for the computer to accurately send and receive data from the hardware device, which is the digital piano in this case. Driver installation typically depends on the type of digital piano you are using, so please refer to your keyboard’s manual on any drivers you may need. However, most digital pianos are plug and play meaning you need not worry about having to manually download and install these drivers. When connecting to your iOS or Android device you will not have to worry about drivers as these typically do not require them. You have now successfully connected your digital piano/keyboard to your computer/device! You have opened a world of possibilities on your journey to creating and performing music. 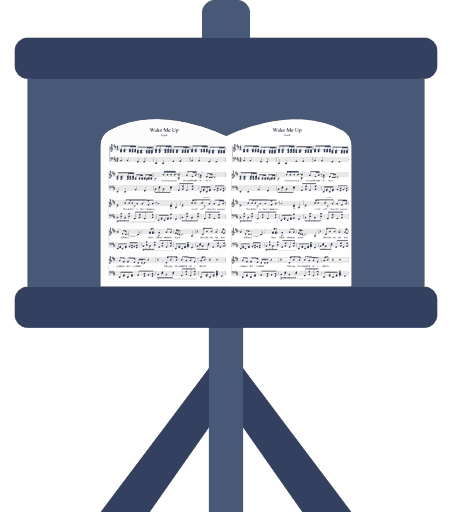 You will be able to use digital sheet music (no more heavy music books, or loose leaf pages! 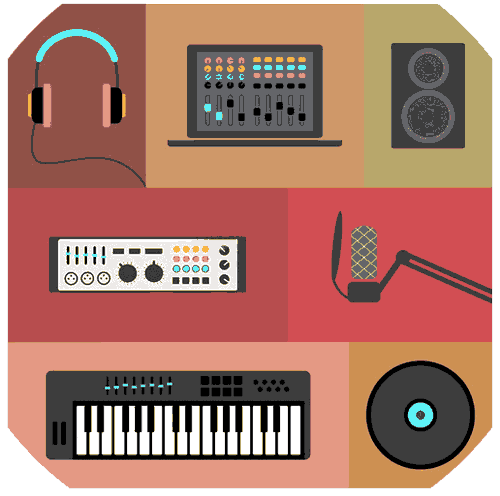 ), notate your own scores, record compositions, edit ideas, record other instruments (guitar, drums, violin, etc) using your digital piano, and learn songs through Apple/Google apps! Now that you have connected your keyboard to your desired setup, it’s time to learn a little about MIDI. MIDI is the information read by your computer, translating notes and CC (Control Change) data into music. For example, you may play a legato phrase on your piano, then repeat it the second time with staccato notes. The computer recognizes the change, and represents the legato or staccato articulations as CC data. From your computer/device, you can adjust these expressions and articulations, and creatively change the way your phrase plays. MIDI differs to audio, as we have control over the notes and CC data. If you accidentally record a MIDI phrase with incorrect notes, you can adjust these via a piano roll screen on your computer or device. Audio is recorded information that has limited control over any adjustments you want to make. You are able to cut, fade, raise/lower the volume, slow/speed tempo with recorded audio files, but with MIDI you have more control to change notes, the way they are expressed or articulated, dynamics, velocity, and modulation. Both audio and MIDI files are very useful to a musician, and being able to work with MIDI will open up more possibilities with your music. 4) Enjoy the possibilities MIDI opens up to you as a performer, listener, teacher/student, and composer. Now that you have the whole world of possibilities to make, learn and enjoy music, it’s time to talk about the apps and software that will allow you to do that. You can use your digital piano as a MIDI controller to control various apps that we’ve split into 4 different categories below. Before we go into any more details, take a look at the apps within each category that we recommend, and which, in our opinion provide, have the best quality and functionality. Connecting to a DAW or piano app through your computer/device can greatly help you to learn music theory, chords, progressions, and learn your favorite songs. The apps available to you vary from beginner to advanced – you can even learn songs without knowing how to read sheet music! 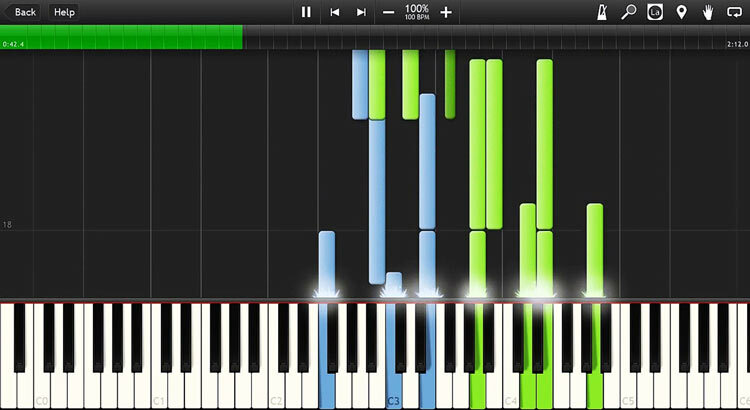 Flowkey is an excellent app to learn songs on the piano in a short amount of time, suited to your skill level. Flowkey is available on the computer and any smart device, and can also brush you up on your music theory skills, as well as practical skills. Once in the app, you can choose through a wide category of music to learn, including classical music, pop hits, and film/TV/game music. The app lets you connect your piano keyboard and tracks your progress as you play. 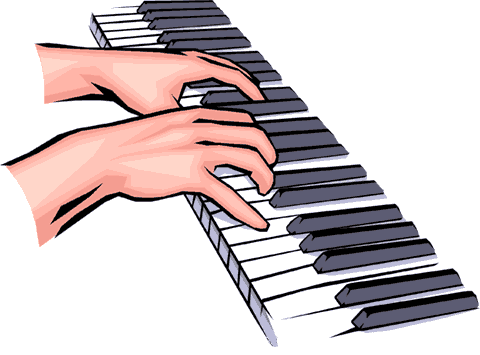 Lessons begin with the basics of piano playing including posture and hand position. As you progress, Flowkey teaches you songs with four chord progressions, as well as major and minor chords. You can use Flowkey as a free trial and decide for yourself whether or not you want to continue using it before you pay for a monthly or yearly subscription. Synthesia is a fun way to learn new piano songs, and is available on the computer and through the App Store/Google Play Store. You can try it for free, or unlock the full version for $40. There are several modes you can choose from including right hand mode, left hand mode, or both. In a nutshell, you could think of Synthesia as the piano version of Guitar Hero, but the main difference is that you actually use a real instrument, not to mention you actually learn how to play that instrument. Worth taking into account is that you will indeed learn how to play songs, however you will not fully learn music theory as Synthesia does not dive into this in detail. You don’t need to be able to read sheet music, and it teaches you at your own pace. If your keyboard is able to light up keys, Synthesia will help light up the notes for you on your keyboard, making learning easier and faster. Available on computer, android and iOS devices, Piano Chords, Scales Companion is piano chords and scales dictionary. This app focuses on identifying chords and scales, which is helpful for piano students, and a great resource for orchestrators and arrangers brushing up on harmony. There is also a handy chord progression builder that allows for you to experiment with different progressions. There are over 1500 chords and 500 different scales, so you have a lot to learn from. The app is MIDI compatible and all you have to do is connect your digital piano to your device of choice and you are good to go. If learning with a piano teacher, it is a great idea to let them know which apps you are using so you can make the most of it! 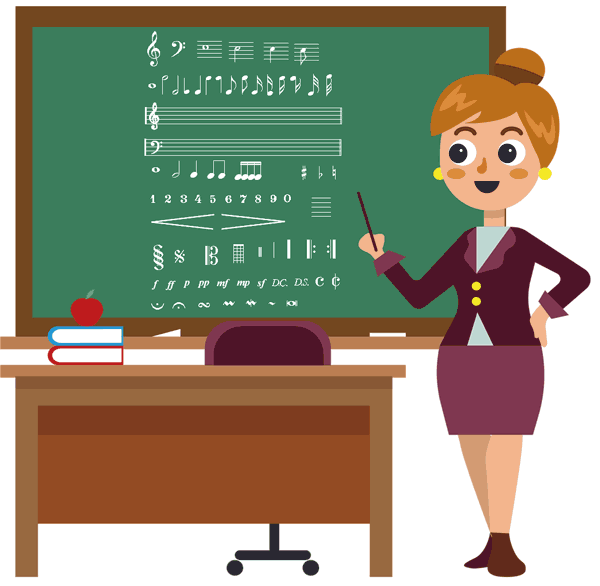 Your teacher will be able to guide you and make achievable piano goals for your needs. Now that you are getting familiar with software applications, and have connected your keyboard to your computer/device, you can now create your own little recording studio set-up in the comfort of your own home! Not only can you teach, learn, and play the piano, but with DAW apps, you will be able to record, create, mix, and edit music. With a knowledge of MIDI usage, you are opening new, exciting ways to make music. You will be able to customize a set-up that makes the most sense to you. You can keep a digital piano into a computer/device set-up, or eventually add MIDI controllers, synth pads, synthesizers, speakers… the possibilities are endless! A great entry-level DAW to start working in is Garageband, which comes free with every Apple computer or device. The software allows you to create loops, and audio/MIDI recordings to edit, arrange, and mix your own song. Garageband is great for producing compositions, tracks for a small ensemble, or generating ideas through the use of Apple loops. This is a good basis for learning to write and mix your own songs. If you want to unlock some more advanced features using an Apple set-up, you can purchase Apple’s Logic Pro X. 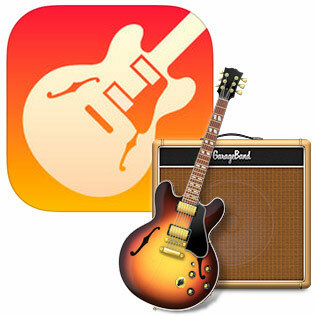 Note this is only for Apple only, and not compatible for Windows desktops, and costs $199.99 on the App Store. A DAW is a hefty upfront price, but usually a great investment if you plan on continuing to write and record your own music. There is a great advantage in owning Logic Pro X, due to the fact that it is owned by Apple – if the OS upgrades, so does the DAW, making it compatible with Apple’s latest Operating Systems (currently on Mojave). Generally, in the DAW world of music, we should wait about 6 months before updating our computer’s operating system so that other DAW software can catch up with compatibility. With Logic Pro X, it updates together with Apple’s OS. Another popular DAW is Cubase 10, compatible on both Mac OS and Windows. This is another advanced DAW where you may want to invest in to have access to advanced features including detailed expression maps, macros, and logical editor presets. Other popular DAW applications include FL Studio and Ableton Live. 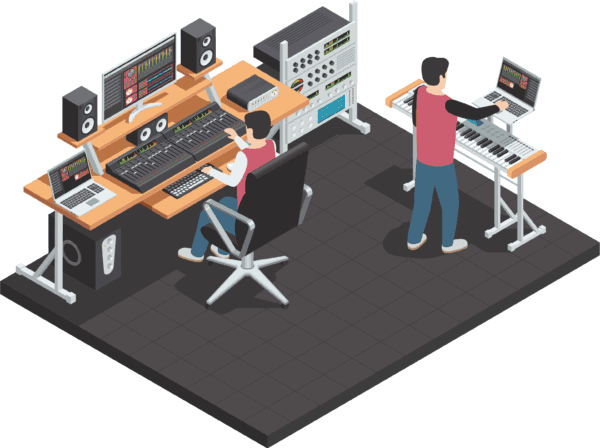 Both of these are great to develop your music production skills, and are popular with electronic music composers. In the audio production world, Ableton Live is one of the most popular DAWs due to the attention to detail that it provides. Apart from being able to record and mix audio tracks, you can also use Ableton Live for your on-stage performances. It’s actually quite popular amongst DJ’s as it can be used for matching tempos of dance songs and fixing timing problems. One of the most popular and most widely used DAWs across the world is Fl Studio. Previously known as Fruity Loops, Fl Studio is a great audio workstation for creating beats and recording music. Loaded with several powerful VST plugins, Fl Studio allows you to access different sounds from the built-in plugins ranging from synths, to keyboards and bass sounds. You can also create and design your own specific sounds and tones, though you will no doubt need a bit of time and patience to achieve this. As an Fl Studio user myself, I can attest to the simplicity of using my own MIDI controller with this DAW. However, Rome wasn’t built in a day and it will no doubt take some practice in order for you to fully realize the potential of this amazing software. Fl Studio is used by some of the most well-known producers around the world including CashMoneyAp, Martin Garrix, Boi-1da, TM88 etc. This should let you know of the potential you can unlock if you take the time to properly learn how to use this powerful DAW. As mentioned above, you can change your acoustic piano sounds into other traditional or electronic instruments, and sound effects. You can take advantage of countless great VST plugins that provide you with top notch quality sounds of upright pianos, grand pianos, vintage pianos, and actually any instruments (guitars, violins, drums, etc.) you can imagine, as well as synths sounds. How does one do that?! With the use of VST (or Virtual Studio Technology) plugins! VSTs, otherwise known as samples, or sample libraries, are pre-recorded notes, sounds and phrases that have been programmed into a plugin to be played by your keyboard. Imagine playing middle C on your piano. Once you create a new track instrument in your chosen DAW, you can select a sample (let’s imagine you choose a violin), then play the same middle C on your piano and it sounds now like a violin playing middle C! You can create multiple instrument tracks, and compose a string ensemble, or perhaps an entire orchestra! You can also learn about different electronically produced sounds, including many different synthesizers and effects. Let’s take a quick glimpse at some sample libraries that can be beneficial to your music-making. Firstly, we’ll discuss Spectrasonics Omnisphere 2, a powerful synthesizer which includes 14,000 sounds, a Sound Match feature that instantly locates related sounds, and an audio import option which allows you to import your own recorded snippets as a sound source – just to name a few! This powerful plug-in is ideal for any modern musician wanting to explore music production, synth-based samples. Although you can record your digital piano into a DAW as an audio file, when it comes to MIDI, you will still need a piano VST, as your digital piano acts more of a MIDI controller to send notes and CC data to your computer/device. An excellent piano library is Pianoteq 6, a virtual copy of the Steinway & Sons D and B models. This VST includes advanced tuning tools, the ability to save presets, and a playlist that stores your recorded MIDI files that you can use for playback (such as for generating ideas, etc). A lot of VSTs can act as standalones, which require nothing else in order for you to make sampled sounds through your keyboard. However, you have the option to use a sampler which hosts many sampled libraries. Note that there are some sample libraries that cannot operate without the use of a sampler. Native Instruments Kontakt 6 is a must-have sampler for a modern musician’s setup. It is the industry-standard for hosting the biggest selection of sampled instruments that also comes with its own library of over 55GB in sampled sounds! Kontakt 6 can act as a basic sampler, or go as in-depth as creating your own sampled instrument. Once you purchase some sample libraries, (eg. Spitfire, 8Dio, or CineSamples), they can then be opened via the Kontakt window. As with all samplers, (Spectrasonics, Kontakt, Play, Garritan, etc), these can be accessed as a standalone application, or opened in the DAW of your choice. Simply create a new software instrument track and open Kontakt in the instrument input selection. You will be able to choose from various options including Mono, Stereo, 5.1 Sound, etc, but generally you will want to open a Stereo track of Kontakt. These other options are there for specific soundscapes for your project. With all this technology arising and various ways to play and create music, there is no need to handwrite/read paper versions of sheet music (if you choose not to). You can easily search and find the sheet music you want, edit it, play along with it, turn pages using your digital piano pedals, (be sure to check your digital piano’s manual that you can do this), and much more. PiaScore – Smart Music Score is an app available for iOS which makes storing sheet music, and reading it accessible in one large portable library! No need to carry heavy books and loose pages of sheet music around when you can have all this at your fingertips. You can browse and edit sheet music digitally, and then erase practice markings on your score not applicable anymore. Some of its features include vertical screen scrolling with an adjustable speed (no page turns! ), smart browsing that makes it easy to tab to the first and last pages without flipping through each page, easy management of scores by tagging composers/artists in a category filing system, and even face gesture page turning with the new iPhone X and iPad Pro. 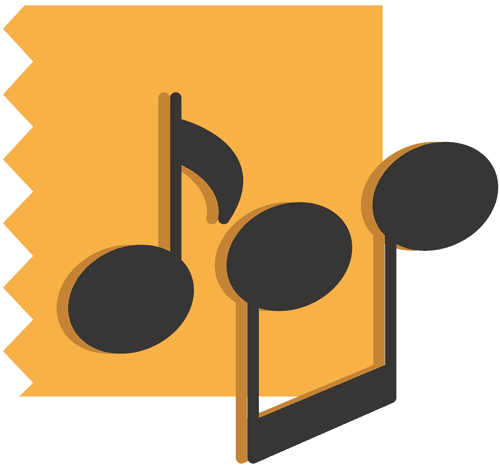 For the purpose of creating notated sheet music, Sibelius, Finale 26, and MuseScore are great applications. You can try a free trial of Sibelius Ultimate before purchasing for the full price. If you are just getting started, perhaps Sibelius First, is best for you. This version is free but has a limitation of four instruments only per score. This is excellent if you plan on transcribing solo or chamber instruments. Sibelius is the next upgrade from Sibelius First, which features scores up to 16 instruments and you will have access to sharing up to 20 scores online with Sibelius Cloud Sharing. Sibelius Ultimate is the full version with unlimited instruments, custom parts and house styles (for how you want your scores to look like). Finale 26 is the most recent version of Finale and starts at $99 for student educational discount, or $600 outright. Be wary, Finale is a little more complicated to use for a beginner learning notation on a computer set-up but presents a more slick design. 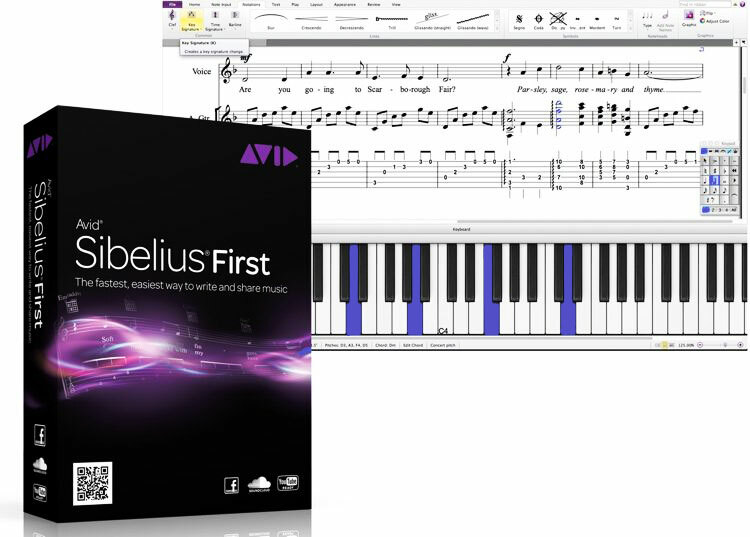 Don’t fret – if you have Sibelius but wish to cross grade to Finale (or vice versa), you may purchase your new notation software for a discounted price. Another beginner-friendly app I recommend if you’re struggling with learning sheet music would be MusicScore. It’s free and excellent for beginners learning sheet music, and students. MuseScore has a supportive, active community who are willing to learn and teach beside you. It is simple to use and can export XML, MIDI and audio files into other programs such as Finale/Sibelius, or straight into your DAW (GarageBand, Logic Pro X, Cubase, etc). Not only did you buy a digital piano, but it seems like you have your own studio set up right at your fingertips! Music technology shouldn’t be a daunting, scary thing, but something to look forward to learning about the possibilities that come with it. I hope you’ve had as much fun as we’ve had teaching you about the exciting ways to create music once you connect your digital piano to a computer or smart device. If you have any further questions or comments, we’d love to hear from you! Please share your experience with any of the software mentioned above, or any others you would like to recommend for us. Happy playing! I got the px-870 what do I need to connect to Chordana play for piano and playground sessions app? Hey Joseph, it depends on what you want to connect it to. 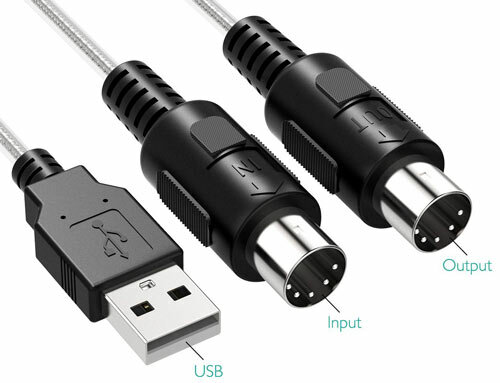 If it’s your laptop/computer, all you need is a USB A to B cable. The Chordana play app is available for iOS and Android devices, what cable you need will depend on the device you’re connecting it to. Check out the table in the beginning of the article and let me know if you found the one you need. I would use a ipad ios. I asked someone at lvmusic if I could use a Lightning to USB B cable and they said that that would not work for chordana play for piano app they said I had to get a USB A to B cable + Lightning to USB Camera Adapter. Is this true? I don’t see any reason why it wouldn’t work (reviews on Amazon confirm that), but just to be safe you can use the “USB A to B cable + Lightning to USB Camera Adapter” as an alternative. Either one should work. Thank you for the quick response. And thank you for all the reviews! Your review on the px-870 is the best review of it out there and the one that sold me on it! Thanks and keep up on the great work!! Thanks for the quick response! Thank you for all your reviews, your review on the px-870 is the best one out there and the review that sold me on it! Thanks and keep up the great work! Thanks for the kind words, Joseph. I hope you enjoy your PX-870! I need to replace my ageing Technics (top end at the time) digital piano and do not want to replace it with a Yamaha, even its top CLP685. My current piano has a four-track sequencer that I use and need all the time but all new pianos have no more than a two-track sequencer. Everyone tells me that with modern apps and connectivity multi-track inbuilt sequencers are no longer necessary but no-one has actually told how I can do it externally. · Not clutter up my sitting-room with expensive external hardware and software when all I want to do is the above. I cannot believe that manufacturers such as Kawai and Roland have abandoned their multi-track sequencers without there being out there an easy and low-cost way of doing it externally that fulfils the feature that they have dropped. I can’t believe, also, that my needs are in some way peculiar or marginal and of such low demand that justify their abandoning this feature. Given what I have specified above, are you able to tell me definitively what I need in order to do what I can so easily do now and how I go about doing it? You are almost my last hope of getting a proper answer to my question. I do hope that you will be able to help.